STORRS – UConn’s collaboration with the German State of Baden-Württemberg is one of the University’s most important global partnerships. 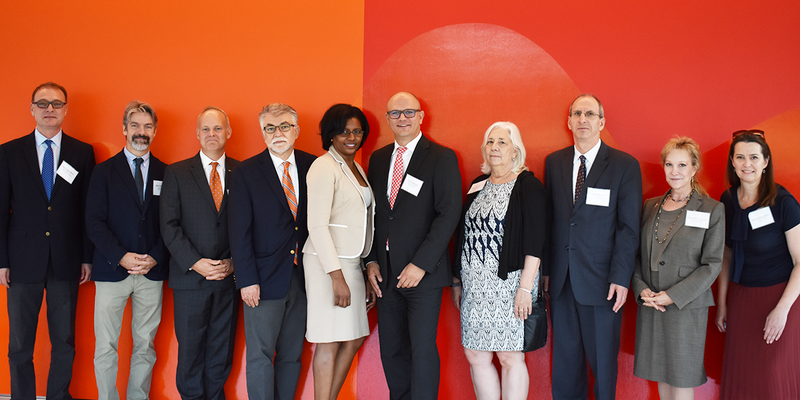 On Wednesday, September 5th, such sentiment was expressed by UConn’s Provost Craig Kennedy and key faculty members as they welcomed Ulrich Steinbach, Deputy Minister at the Baden-Württemberg Ministry of Science, Research and the Arts, for a visit to campus. Hosted by Global Affairs, Deputy Minister Steinbach was accompanied by Martina Diesing, Program Officer with the Baden-Württemberg Ministry of Science, Research, and the Arts, and Lucius Lichte, Science Liaison Officer with the German Consulate in Boston. Their visit began at UConn Health in Farmington to meet with CEO & Executive Vice President for Health Affairs Dr. Andrew Agwunobi and Chief Financial Officer Jeffrey Geoghegan, as well as to view the facility and understand the challenges of financing a university hospital in the United States. Their visit continued at UConn’s main campus at Storrs to discuss a range of issues including the tenure process and the financing of public institutions of higher education in the United States. The delegation had the chance to see the new Engineering and Science Building and the Innovation Partnership Building at the UConn Tech Park – showcasing UConn’s position at the forefront of advanced engineering and manufacturing education and research. The Baden-Württemberg - Connecticut Exchange began in 1991 as the result of a legislative partnership between the two states. The Connecticut Office of Higher Education asked UConn to take over the administration of the program in July 2015. The exchange agreement invites all students enrolled in participating four-year colleges and universities in Connecticut to study at any participating institution of higher learning in Baden-Württemberg. UConn’s highly successful EuroTech program is part of this exchange due to the strong engineering and manufacturing base in both Connecticut and Baden-Württemberg. The five-year program leading to a dual degree BA in German and BS in Engineering includes a six-month internship in Germany, and is designed to prepare students for a career in the global market by increasing their ability to work in a variety of cultural settings. Graduates typically work for German and American companies that operate in both Baden-Württemberg and Connecticut, such as Bosch, Procter & Gamble, Bayer, and Trumpf. At a reception attended by key stakeholders across the University, Provost Craig Kennedy reinforced the close friendship between the two states, and expressed his hopes for future collaboration in the areas of research and innovation. Deputy Minister Steinbach echoed his sentiments, and announced that with UConn President Susan Herbst’s upcoming visit to the state, the government of Baden-Württemberg looks forward to building upon the success of current exchanges with the establishment of a new program grounded in UConn’s leadership in the field of human rights education. For more information on the Baden-Württemberg Exchange, visit the program website. For additional information on the economic ties between the State of Connecticut and Germany, listen to this episode of MetroHartford Alliance’s Pulse of the Region Podcast, featuring a discussion with the German American Chamber of Commerce. This entry was posted in News and Announcements.